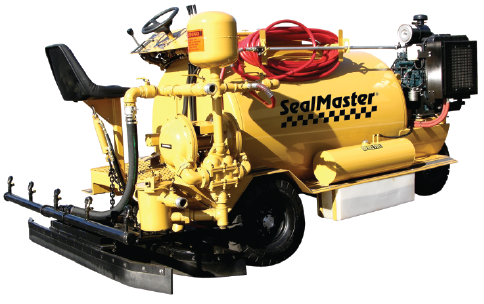 Aegis Asphalt can sealcoat your asphalt driveway or parking lot more efficiently than ever before with our new SealMaster SP 300 Dual Spray/Squeegee machine. Ensuring a smooth finish every time starts with choosing the correct application method. Here are some considerations for determining whether your project needs spray, squeegee or dual sealcoating application. Spraying sealcoat is a popular method because it is quicker to apply than using a squeegee. It also produces a more uniform and smooth finish. To apply the spray sealcoat, asphalt contractors use a trailer or skid-mounted spray system and a hand wand or distributer bar. A distributor bar empties the machine faster than a hand wand for increased efficiency. With the spray method, asphalt contractors apply an initial coat and follow it with a second coat to cover any missed spots. The second coat, which should be applied an hour or two after the first, ensures prevention of water entering the pavement surface. Squeegee application is preferred for asphalt with rough or porous surfaces. Your asphalt contractor will use a ride-on machine with a squeegee or a manual individual squeegee tool to pack the sealant into the crevices of the pavement. While this the squeegee method needs more attention for an even spread of the sealcoat, it achieves stronger bonds on irregular surfaces. Aegis Asphalt uses a dual applicator machine for your sealcoating needs. Dual application allows for versatility in all surface types. We use a ride-on dual applicator machine which gives us the ability to both squeegee and spray, maximizing the sealcoat quality on a variety of surfaces. With this method, we first apply the sealcoat using the squeegee and then follow up with a spray application. The dual applicator method allows us to deliver results that last 40 percent longer than a spray or squeegee application. Aegis Asphalt’s professionals can extend the life of your asphalt surface. Contact us to learn more about our sealcoating services in Eugene, Roseburg and Coos Bay.